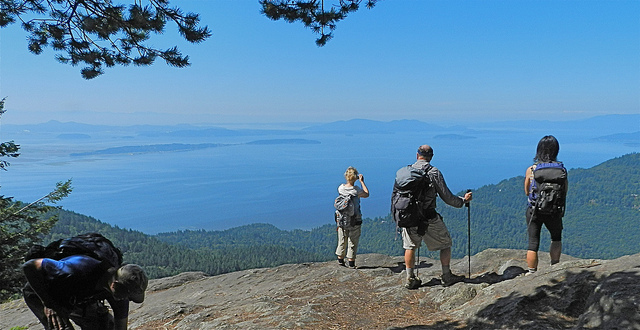 Join us for a meditation hike to gem of the Chuckanuts: Oyster Dome. Our final mindful foray into the local mountains to close the season. This popular local destination, a prominent rocky outcrop on the southwest face of Blanchard mountain, will be our place of Closing the Mountains for the ending of our ritual hiking season. This hike, inspired by traditions on Tibetan sacred mountains where the last ritual circuit of the season was performed by priests putting the mountain to rest, will be a 4 mile round trip with about a 500’ elevation gain. Meet at the Dharma Hall for carpooling at 9am. Those coming from Skagit can meet us at the trailhead at the Samish Overlook at 9:30, via the Alger exit (please indicate in the RSVP registration where you will meet us). This year over our round of ritual hikes we've carried sea water to the tops of each of the 3 major branches of the Nooksack River drainage and exchanged sea water for fresh enacting the water cycle in our watershed. After the Closing the Mountains hike we'll take the 3 little bottles of water and return them to the sea in a brief ritual. Meet at the Larrabee State Park band stand for a short walk to the beach and ceremony. Hikers will be invited to stop for this on their way home if they have time and other sangha members are invited to join us there. Contact Bob with questions and to let him know.